A novel seismic imaging technique which can penetrate difficult geologies such as salt formations could raise the Gulf of Mexico to a whole new level of exploration importance. Sean Ottewell reports. Wave equation migration (WEM) is a technique that takes into account the multiple arrivals of seismic waves in the sub-surface. As such, it overcomes the limitations of standard Kirchhoff pre-stack depth migration (PSDM) which only takes into account the first arrival of seismic waves. Compared with normal Kirchhoff migrations, the WEM method increases the focusing of seismic images in areas with complex velocity models and excels in imaging below geology that is traditionally difficult to penetrate with seismic signals, such as salt formations. Now Spectrum has announced what it describes as 'impressive' results concerning sub-salt geology after using WEM techniques to process the 28000km Gulf of Mexico seismic survey (Figs. 1 and 2). The 2D survey was processed at Spectrum's newly refurbished Houston data processing and imaging facility using both Kirchhoff and wave equation depth migration processing. 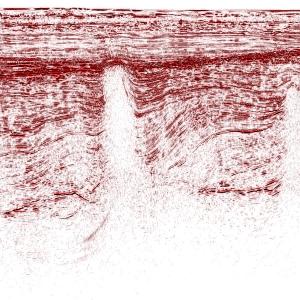 Andy Cuttell, head of Spectrum's worldwide data processing operations, explained the company's approach: "We first processed the seismic using Kirchhoff eikonal PSDM, which produced reliable data and revealed detail about the complex geology in the Gulf of Mexico. We then considered applying WEM and this has paid off by revealing clearer sub-salt definition." 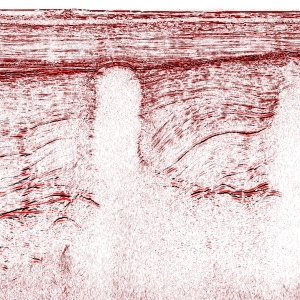 Spectrum scientist Guillaume Richard commented: "Both Kirchhoff and WEM processing hold value to the petroleum geoscientist, because they help reveal different geological features. However, the workflow is quite different because the input for WEM consists of shot gathers. Using both techniques Spectrum has been able to learn important information on the sub-salt structure from this Eastern Gulf of Mexico data." Impressed with the results from this survey, the Houston team also tested the WEM technique on Spectrum's 'Big Wave' phase one multi client project. ig Wave is a massive survey in the Eastern Gulf of Mexico designed to acquire 30000km of data in advance of lease sales in the region. Spectrum's team concluded that it showed clear potential to improve the imaging of the Florida escarpment and the base of salt definition. Spectum's findings are an important addition to knowledge about the Gulf of mexico, which contains very thick and concentrated gas-hydrate-bearing reservoir rocks which have the potential to produce gas using current technology. Recent drilling by a government and industry consortium confirm that the Gulf of Mexico is the first offshore area in the US with enough information to identify gas hydrate energy resource targets with potential for gas production. Gas hydrate, a substance comprised of natural gas and water, is thought to exist in great abundance in nature and has the potential to be a significant new energy source to meet future energy needs. However, prior to this expedition, there was little documentation that gas hydrate occurred in resource-quality accumulations in the marine environment. "This is an exciting discovery because for the first time in the US Gulf of Mexico, we were able to predict hydrate accumulations before drilling, and we discovered thick, gas hydrate-saturated sands that actually represent energy targets," said US Geological Survey energy programme coordinator Brenda Pierce. 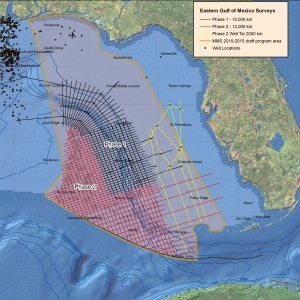 The US Department of Energy (DOE), the US Geological Survey (USGS), US Minerals Management Service (MMS) and a group of international energy industry companies under the management of Chevron were responsible for conducting this first ever drilling project with the goal to collect geologic data on gas-hydrate-bearing sand reservoirs in the Gulf of Mexico. "We have also found gas hydrate in a range of settings, including sand reservoirs, thick sequences of fracture-filling gas hydrates in shales, and potential partially saturated gas hydrates in younger systems," said USGS scientist Timothy Collett. "These sites should provide a wealth of opportunities for further study and data collection that should provide significant advances in understanding the nature and development of gas hydrate systems." - The collection of a comprehensive set of logging-while-drilling (LWD) data through expected hydrate-bearing sand reservoirs in seven wells at three locations in the Gulf of Mexico. - LWD sensors provided unprecedented information on the nature of the sediments and the occurrence of gas hydrate. The expedition discovered gas hydrate in both sand and fracture dominated reservoirs.The discovery of thick gas-hydrate-bearing sands validates the pre-drilling integrated geological and geophysical approach used to identify the targets and provides increased confidence in assessing the energy resource potential of marine gas hydrates. In the case of the Walker Ridge and Green Canyon drill sites gas-hydrate-bearing sand reservoirs between 50 and 100ft thick were discovered. The discovery of concentrated gas hydrates in sand reservoirs has made Walker Ridge and Green Canyon prime locations for future research drilling, coring, and production testing. The announcement by the USGS also coincided with Chevron's own announcement that it has started crude oil production from its Tahiti Field, the deepest producing field in the Gulf of Mexico. First oil from Tahiti was achieved on 5 May. Daily production is expected to ramp up to approximately 125000 barrels of crude oil and 70million cubic feet of natural gas before the end of the year. The Tahiti Field is one of the largest in the Gulf of Mexico. It was discovered in 2002 and is estimated to contain total recoverable resources of 400 to 500million oil-equivalent barrels. The total cost for the first phase of the project is US$2.7billion and represents one of 40 projects in which Chevron's share of the investment is over US$1 billion. The Tahiti Field is located 190miles south of New Orleans, in approximately 1250m of water. "Tahiti is a significant addition to our growing reserves and production," said George Kirkland, executive vice president, global upstream and gas. "It is another demonstration of our deepwater expertise, and our ability to execute an industry-leading queue of major capital projects." Tahiti is located at Green Canyon Blocks 596, 597, 640 and 641. Primary pay sands are Lower to Middle Miocene from 23000 to 28000feet and lie below a salt canopy ranging from 8000 to 15000 feet thick. The deepest producing well is more than 26700 feet, a record for the Gulf of Mexico. Production is from two subsea drill centres tied backed to a floating production facility supported by a truss spar. Chevron holds a 58 per cent working interest in Tahiti and is the operator, StatoilHydro holds a 25 per cent working interest, and Total owns a 17 per cent working interest.